I have always been interested in behavioral science & psychology. Why do rational, well-minded people behave the way they do and why do they make certain choices that work against their favor even after being provided all the relevant information to make the right decision. I am not trained in psychology and my business background in finance and accounting is far from looking at humans to this depth if even at all. However, given my interest in this topic and the desire to get a better understanding of why I do the things I do made me dig deeper. Behavioral finance and behavioral economics studies the effects of social, psychological, cognitive and emotional decisions of individuals and institutions. It also looks at what systems, designs, policies and processes can we put in place to make sure that we are making the right decisions or decisions that will help us prosper financially in the long-term. People know they should save now for retirement, they know they should pay off their debts and live within their means, but, why don’t they? Of course, a part of it is keeping up appearances but there is more to it. Even with the best of intentions, we can still end up not saving, not paying off debt and not living within our means. Most group retirement savings programs offered through your employer will require you to opt into the program once you become eligible. This may be once you have passed your probationary period or after a certain number of months or years of service. Employees are given the opportunity to decide whether they want to save for their retirement and in some cases, the employer match their contributions. This sounds like a pretty sweet deal, but still not many people save. 68% of Americans that have a retirement savings program (401k) through their employer are not using it (Forbes). Of those 68%, only 67% of them fully utilize the maximum amount employers will match. That is the equivalent of leaving money on the table. Many scientists believe the major reason for this is employees are required to opt in and many times months or a year after they have started working and are introduce to the option. An alternative approach would be to automatically enroll employees in the retirement savings plan by getting them to fill out the necessary paper work (i.e. banking info, investment allocation etc.) at the orientation stage of their employment. Once they become eligible for contributions, the money automatically gets deducted from their account. A study that used this approach for their company found that there was a 93% success rate and only 7% of the employees opted-out after being opted in to the program. Since the contributions were only 5% of the their pay (with the company matching the other 5%), many employees didn’t even notice and those that did were not bothered by it (Saving for Retirement on the Path to Least Resistance). The success of this approach comes from the fact that people already find it hard to save. By having immediate enrollment (when the person gets hired) and having the money deducted as soon as they become eligible, it removes the procrastination and stress of having to make this additional decision months down the line. We probably all have had to deal with a pay decrease or a temporary job loss where our income was impacted. However, for most of us, we could cut back and make it work. This approach is similar except the money we take home is going towards our future benefit. If you follow the personal finance community than you are probably sick of hearing this term (automate your savings), but the reality is that from a behavioral perspective, it works. With the various financial responsibilities that are calling for our attention coupled with the different wants we have, automating our savings essentially makes the decision for us and the money is spoken for, hopefully, before we decide what to spend it one. Having the savings account with a different financial institution. By keeping the savings and checking account separate, you can minimize the desire to do a quick transfer between accounts. Locking in the money in fixed income / CD’s or investments. Certificate deposits require the money to be locked in for a certain amount of time before the full interest can be realized. With penalties for withdrawing early, reduces the chance for money to be taken out prematurely. Put your money in a registered account like a 401k or RRSP in Canada. These types of accounts have major penalties for withdrawing the money prematurely. This creates an effective deterrent for keeping the money in the account. Visual reminders of the progress towards our savings goal can be a great motivational push for us to keep saving. But before you can set a visual reminder, you need to know what you are saving for. For example, saving for retirement can seem so difficult because most of the time we can’t visualize what retirement will look like. Simply saying ‘my goal is to save for retirement’ is not enough. Since I can’t fully picture what my retirement will look like, I use smaller milestones to keep me motivated. For example, maybe your goal would be to save the first $100,000 for retirement. A visual reminder may be the trips you would be able to take with that money or the freedom to quit your job and pursue your passion. Pictures can speak volumes and finding the right one can make all the difference. Check out the top retirement calculators to see how much you need to save. 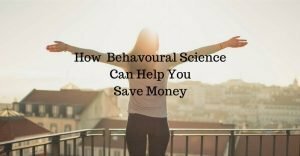 Even with the understanding of how behavioral science can impact our personal finance, there still need to be the desire to save. I think without wanting to save, then no system or design would make a difference.